The professional quality AHMCTXL V2 allows you to test the most frequently used audio, video and data cables quickly and effortlessly. It provides automated and manual test modes with dual LED strips indicating proper pin connection and continuity. 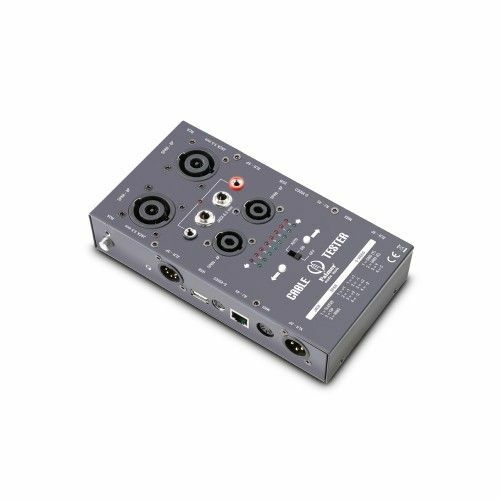 The AHMCTXL V2 can test cables with Speakon 4-pin and 8-pin, XLR 3-pin and 5-pin, 3.5 mm and 6.35 mm TS and TRS, RCA, DIN/MIDI, USB, RJ-45 and S-Video connectors. It includes a pair of probes that enable troubleshooting cables with other types of connectors or the wiring in studios and installations. The compact AHMCTXL V2 Cable Tester for professional and home use comes in a rugged steel housing with powder coating finish for years of reliable service.